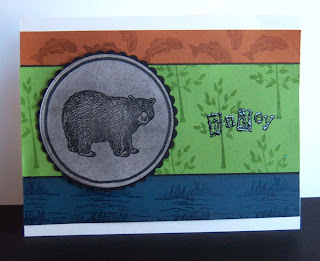 I made this card for my Alaskan b-i-l who has a birthday later this month. Masculine cards don't come easy, and I'm rarely 100% satisfied with them when I'm finished. This one was an exception to that -- it was both easy and I'm pleased with the way it's turned out. This is a wonderfully masculine card. I love that bear! I have had the tree stamp for a while...maybe 7 or 8 months??? It was in the Michael's dollar bin -- it's a wood mount stamp.